There will be skill-sharing events, workshops and lectures, documentaries, an excursion to the abandoned WISMUT uranium mine and opportunities for public actions. Anti-nuclear experts as well as organizers and activists will share their knowledge with us. Everyone is welcome to offer workshops or presentations on topics they are working with. We hope many participants will tell about the anti-nuclear struggles or about the nuclear policy in their regions. This gathering will be a platform to talk about your current struggles, upcoming campaigns and actions. It would be wonderful if you have issues you want to bring up. 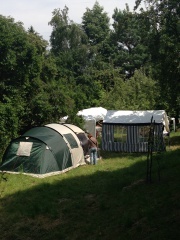 The venue of the anti-nuclear summer camp is the orchard of the "Project House". There is space for your individual tents, a few bigger group tents and other structures will be set up, too, and an outdoor kitchen will be the center of food supplies and group meetings... We intend to set up some compost toilets and a solar shower in addition to the sanitary infrastructure of the Project House. We want this camp to be family friendly to make it also possible for activists with children to participate. We also will do our best to help with support in as many languages as possible based on (non-professional) whisper translations etc. Please consider not to bring your dogs to the camp. If you are interested in the gathering, please get in touch with us via email to "summercamp AT nuclear-heritage DOT net". We will also provide more information later on this event page. Uranium is the material that connects almost all aspects of atomic power. It is the fuel used in most commercial reactors, it passes a number of stages of the "uranium spiral", it is connected to many radioactive shipments and it eventually also is part of the unsolvable problem of safe final disposal of nuclear waste. We are faced with issues posed by this material in uranium mines which mean large destruction of natural areas, radiation exposure to workers and significant health impacts on local residents nearby the mines frequently situated on indigenous land. Besides, uranium is used for atomic weapons and as "depleted uranium" (DU) it is part of armor as well as of armor breaking ammunition. The usage of uranium has an impact on climate change rather than providing a solution to it. In the international anti-nuclear summer camp initiatives and activists from uranium mining and processing facilities will meet each others as well as campaigns against shipment of uranium in different stages or against the military component of the uranium industry. Basic and specific knowledge will be shared, mutual activities shall be developed. For anti-nuclear groups the gathering will pose the chance to meet interested people, to find new supporters and to get in touch with new partners for their struggles against the uranium industry. Besides, we will also have a field trip to the former WISMUT uranium mining area which formerly was the third biggest uranium producer in the world - and which today is subject to heavy greenwashing approaches of both nuclear industry and authorities as well as to ongoing failures in safe reclamation of the former mining facilities. In most European countries lifetime extension of old commercial reactors is a current topic. Even in states which actually follow a „nuclear phaseout“ policy the question whether aging nuclear power plants will be licensed for some more operational years has been raised, particularly by nuclear lobbyists. Aging is a big problem in the nuclear technology. Due to the strong neutrons bombardment atomic reactors are faced to higher corrosion and thus to an increasing risk of safety breaches. The leakage of radioactive material is one issue, another one is the possible lost of safety mechanisms and thus of nuclear accidents. A number of countries, e.g. Belarus, Czech Republic, Finland, Russia, United Kingdom, are pushing forwards the construction of new commercial reactors – although at last the series of reactor explosions in Fukushima, Japan, in 2011 illustrated the impossibility to guarantee the safe operation of this technology. Though the proponents of these developments try to create another impression, all these new builds are based on the old reactor models that have been built before, too. Additionally the society these days is more and more faced to an understanding that no optimistic perspective is to be expected for handling the nuclear industry's residues. Although no safe solution can be provided anywhere in the world for the radioactive waste, lifetime extension and new reactors construction will massively increase the amount of nuclear material to be dealt with. The international anti-nuclear summer camp invites activists and organizations struggling against new reactor constructions and lifetime extension to exchange experiences, inform about the situation in their regions and to figure how to strengthen the movement against these mad developments. This draft of program is in progress and will be extended stepwise until the actual camp start. * On several days we won't follow the daily program schedule as the arrangements will differ (e.g. excursion day, action day,...). 10.30 AM "How nuclear lobby works, its consequences and antinuclear resistance in Turkey"
12.25 PM "France, the happy atoms land"
3.30 PM "Flashback on 30 years of Austrian resistance against EURATOM"
4.30 PM "A very long fight against nuclear power in Sweden"
5.00 PM "Situation in Japan after Fukushima nuclear accident"
7.30 AM "Activist chill down rucksack"
9.30 AM "Czech Republic: Update on uranium mining, new reactor plans and nuclear waste repository siting"
The lecture will cover these topics as follows: 1. The uranium mine Rožná (opened in 1957) has finally closed since the end of 2016. Although a new Raw Material Policy gives an impression of having shifted its focus from uranium to lithium as a source of energy sufficiency for next generations, it has also left the option open regarding uranium mining in the future. 2. The nuclear industry backed by the Ministry of Industry and Trade has also taken various steps in making new nuclear reactor in Dukovany (or Temelin) NPP a reality, despite the inexistent economic viability of the project. 3. In April, the Day Against Repository III. took place, newly under the auspices of the Platform Against Deep Repository founded in 2016, to mark municipalities and associations' increasing frustration with the siting process for a deep geological repository by the state Radioactive Waste Repository Authority (RAWRA/SÚRAO). (audio lecture) "Lifetime-extension: underestimated nuclear threat?" There are few nuclear new builds in Europe and many companies are reluctant to start them as they turn out to be way more expensive than anticipated and usually have desastrous effects on the economy and rating of the companies. This makes looking for lifetime extensions of existing nuclear power plants a seemingly valid alternative for nuclear companies. Which in turn makes the lifetime-extensions an important development to watch, when old plants are allowed to run 20 or more years longer, often without proper environmental impact assessments, public consultation, let alone transboundary consultations. The workshops gives an overview and explains the problem around the Ukrainian and Belgium lifetime-extensions in greater detail and looks into protest activities around them. "Uranium mining & impact on indigenous people - part I"
"Atomic facilities Gronau and Lingen excluded?" In this workshop the two single atomic facilities excluded from the German so-called "nuclear phase-out" will be in the focus. The uranium enrichment facility in Westphalian Gronau is owned by the worldwide operating corporate group Urenco, which is the number two in the world after Rosatom. Concerns of dual use (usage for nuclear weapons), problematic sale at the world market and the strategy of the company will be discussed. The second atomic facility excluded is the fuel elements factory (ANF) in the Lower Saxon Lingen. It is operated by Areva and supplies for instance the continuously scandals generating reactors in Belgium Doel and Tihange. The latest developments and the cooperation of the anti-nuclear initiatives and past as well as upcoming actions will be presented. "Uranium mining & impact on indigenous people - part II"
5.00 PM "Without it the nuclear industry would long have been dead: the EURATOM Treaty"
What is it that protects and supports the nuclear industry in the background, largely unknown? And shall secure a nuclear future for the European population even in 30, 50 and 100 years? And has never been changed since the nuclear euphoria of the 1950s-1970s? How has it been possible for the most criticized industry to survive "the biggest industrial catastrophe in history", and even proclaim a "renaissance in Europe and worldwide"? - Some EURATOM structures/institutions that secure privileges and protectionism for the nuclear business. Will they continue to thwart democratic control, reform and abolition of the anachronistic EURATOM Treaty? "The problems of "Asse II" nuclear waste depository in a former salt mine"
From 1967 to 1978, some 50,000 cubic meter of low and medium active radioactive waste were stored in the Asse II minesite on behalf of the German Government. Given the current state of knowledge, long-term safety can only be guaranteed by the retrieval of the radioactive waste. visit of WISMUT museum "Objekt 90"
1.00 PM field trip to WISMUT reclamation site "Schmirchauer Höhe"
A local organizer specialized in this field will present us insights to the problems of WISMUT reclamation English translation needs to be organized by us. 9.30 PM "Increased perinatal mortality after atmospheric nuclear weapon tests, after Chernobyl and Fukushima"
10.30 PM "Uranium mining reclamation problems in the United States"
11.40 AM "The power is in your hands - The Aarhus Convention and the example Hinkley Point C"
The German Aarhus Konvention Initiative is a civil society movement founded to make sure that the international treaty for the protection of the environment will be correctly implemented into German law. Their founder Brigitte Artmann won a complaint against the British planned NPP Hinkley Point C. The faulty Environmental Impact Assessment procedure with the missing international public participation made the whole project unlawful. Together we'll brainstorm creatively in this workshop how to go on with the HPC case. The decision of the Aarhus Convention Implementation Committee is for example also relevant for the NPP projects in Finland and CEE. We can also check the legal relevance of the Aarhus Convention for your projects. For a short overview about the international treaty please have a look at this flyer: "Protecting your environment: The power is in your hands - Quick guide to the Aarhus Convention" "Introduction to the Nuclear Heritage Network"
Since autumn 2013 the Nuclear Heritage Network as a new structure has the "International Network Office" in Döbeln, Germany - so far it is offering opening hours every Wednesday from 2-4 PM CET to support anti-nuclear groups looking for experts and speakers for their events and to help them to connect to other anti-nuclear groups working in similar fields. Partly there were three volunteers at once in the Network Office; at the moment we are looking for new volunteers for the next months. With the ATOMIC BALTIC network/project a new regional anti-nuclear network for the Baltic Sea region was developed which is connecting and supporting groups and activists in the area. The NukeNews newsletter system has been started in 2011 and will soon probably include more languages. Upcoming events have been continuously collected and published on the Nuclear Heritage Network website - several hundred local and global events can be found there now. However, still a focus on certain regions from where the information flow works better, is visible. The plan is to improve that and to receive the events from other countries, too. Besides that, the plans to produce and spread multilingual information materials need active support, which might also be brought forwards in this gathering. 12.45 PM "Anti-nuclear World Social Forum 2017"
After Tokyo and Montreal in 2016, there will be an anti-nuclear Social Forum dedicated to all aspects of the nuclear question (civilian and military) in Paris on November 2-4, 2017. We'll let you know about the recent preparations for this Forum, and how much you are welcome if you want to join us and to propose a workshop or other activities related to this theme. 1.30 PM "Anti-nuclear activities in Australia, India and Turkey"
"Past, Current and Future Actions against EURATOM"
In small groups, we will work on short documents, newspaper articles, tables, cartoons etc. From such material, we can draw conclusions and lessons on the behind-the-scene influence of the EURATOM Treaty, on sometimes "hair-raising" plans and activities of EU and national bodies on the basis of EURATOM articles and regulations, as well as on attempts at reform of the Treaty. 3.00 PM "Hinkley Point overview"
(Skype lecture) "Uranium transports & actions"
Uranium from Kazachstan, Usbekistan and Niger is regularly transported via Hamburg, Münster, Köln and Trier to France. The uranium enrichment factory in Gronau ist not part of the so-called "phase-out" and the fuel production in Lingen ist also running without any plans for closing. Both sides are heavily dependent on nuclear transports. We are investigating the transports connected to these nuclear sites and doing direct actions against. The talk will be about the transports and our resistance against. "Port of Hamburg - international platform for atomic shipments"
Hamburg harbor regularly works as port of transshipment for radioactive material for atomic power stations arriving from all over the world to be forwarded by sea worldwide. Together with other dangerous goods like weapons and ammunition these materials are transported and storage next to each other increasing the threats posed by them. This presentation will inform about the risks and the campaigns to make the Port of Hamburg change their policy to become a nuclear shipments free harbor. 4.00 PM "Russian nuclear reactors export - how to stop it?" While we observe the global decline of nuclear energy, some countries still consider new reactor construction. The Russian State Nuclear Energy Corporation (Rosatom) has started a new NPP construction in Belarus, pushes the new nuclear build in Finland, Turkey and some other countries in Europe. Rosatom has the political support from the Russian leaders and has access to the state budget money. This corporation extensivly uses its political and financial power to promote reactor export projects. Civil society in Belarus, Finland, Turkey try to stop the dangerous projects. We can discuss the international actions and campaign against it. "Consequences of Climate change on Nuclear power plants"
Scientists say we are at a turning point and it will be too late to go save the world after 3 years. This means, Climate change does matter! It will put nuclear power plants in a much more risky position. By this workshop we invite you to think about climate change issue, how it will effect our world and develop strategies to stop nuclear power plants in all around the world. 10.45 AM "Introduction to the Nuclear Heritage Network"
11.15 AM "World Nuclear Heritage Brunswick Land"
Four nuclear plants are placed in the region surrounding the city of Brunswick in Lower Saxony (Germany). Since several decades people are protesting against them. 3.00 PM "Network Office looking for volunteers"
Please add here the presentations you would like to offer at the Network Gathering. This presentation will inform about the Japanese current state after the Fukushima nuclear accident. What is happening to Fukushima nuclear power plant? What is happening to the anti-nuclear movement of Japan? From official disinformation on Austria's entry into the European Atomic Community to our government's complaint before the European Court of Justice (ECJ) against Britain's state subsidies for Hinkley Point C, crucial to any new build in Europe. - How we "discovered" the EURATOM issue. - Information on, and activism against, EURATOM membership, before Austria joined the EU - and ever since. - Building pressure on the government by a large variety of actions and instruments. - The attitudes of the political parties. - After Fukushima, carrying resistance from Austria to Germany? The movement is losing members and too few young people are interested. The phase-out is slowly on way, the economy is the reason. In 1985 the Swedish Parliament decided year 2010 to be the final date for a total phase-out. It has not yet taken place. A majority of the Swedes is against nuclear power. Our neighbour Finland is a big problem. This lecture is in 2 parts: First, a kind of short historical perspective on the French nuclear situation. And the power game between lobbies, politicians, activists and public opinion. Second, based on the French nuclear map with presentation of various installations, showing how the all-nuke choice is making the whole country rotten… even without people realize it. This lecture will be in two parts. The first part will cover 4 items such as: Justifications of government about establishing nuclear power plants, current nuclear power plant plans in Turkey and their highlights, some details about companies which are involved into these nuclear power plant plans, and reactions from civil society against actions taken by the government to progress in nuclear power plant plans. In the second part, resistance and protests against nuclear power plant plans will be described from a historical perspective including direct effects of Chernobyl nuclear disaster on society. The lecture will cover these topics as follows: 1. The uranium mine Rožná (opened in 1957) has finally closed since the end of 2016. Although a new Raw Material Policy gives an impression of having shifted its focus from uranium to lithium as a source of energy sufficiency for next generations, it has also left the option open regarding uranium mining in the future. 2. The nuclear industry backed by the Ministry of Industry and Trade has also taken various steps in making new nuclear reactor in Dukovany (or Temelin) NPP a reality, despite the inexistent economic viability of the project. 3. In April, the Day Against Repository III. took place, newly under the auspices of the Platform Against Deep Repository founded in 2016, to mark municipalities and associations' increasing frustration with the siting process for a deep geological repository by the state Radioactive Waste Repository Authority (RAWRA/SÚRAO). 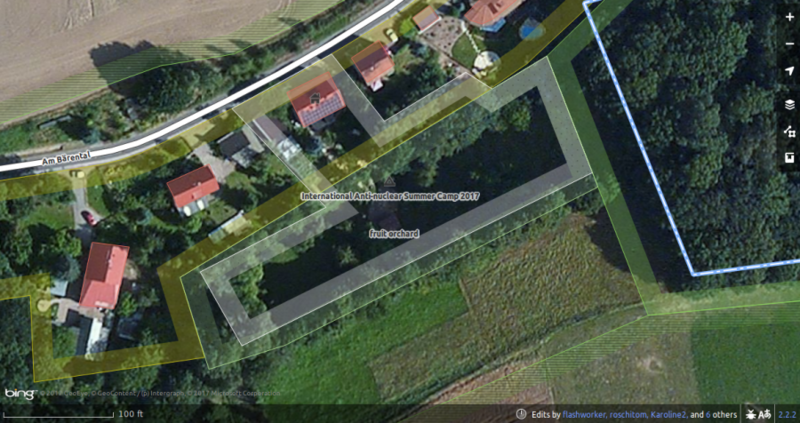 The second atomic facility excluded is the fuel elements factory (ANF) in the Lower Saxon Lingen. It is operated by Areva and supplies for instance the continuously scandals generating reactors in Belgium Doel and Tihange. The latest developments and the cooperation of the anti-nuclear initiatives and past as well as upcoming actions will be presented. There are few nuclear new builds in Europe and many companies are reluctant to start them as they turn out to be way more expensive than anticipated and usually have desastrous effects on the economy and rating of the companies. This makes looking for lifetime extensions of existing nuclear power plants a seemingly valid alternative for nuclear companies. Which in turn makes the lifetime-extensions an important development to watch, when old plants are allowed to run 20 or more years longer, often without proper environmental impact assessments, public consultation, let alone transboundary consultations. The workshops gives an overview and explains the problem around the Ukrainian and Belgium lifetime-extensions in greater detail and looks into protest activities around them. The anti-nuclear power movement in Germany had some of the hardest battles in the 1970s, and inspired a variety of social movements and developments in the 1980s until public opinion against nuclear power emerged in the aftermath of the Chernobyl catastrophe in 1986. Nevertheless, it took more than two decades of hard struggle until the nuclear phase out 2011 finally became law. No doubt that was a success. But it had its price. Although there has been no change in their daily practice, politics and administration have regained the opinion leadership on nuclear safety and security and dealing with nuclear waste. Most of the stakeholders involved let themselves guide by the formal procedures at the sites and in the federal policy in their daily practice. This presentation will provide a brief historical overview of the nuclear conflict in Germany and some ideas about the need for a restart. Malvesi refinery is the uranium gateway to Europe. It is a strategic site for Areva, between uranium mining and nuclear fuel chain. A French chemistry and physics teacher living near Malvesi would like to share their experience as an alert citizen watching this site for ten years and on their work to develop French wikipedia articles on nuclear and uranium. What we will speak about: What sort of wastes; history of the project and sociology of the area; 20 years of opposition, and revival of new opposition; scientifics doubts; French nuclear policy : double language; international projects. This lecture will present some impacts of atmospheric nuclear weapon tests, Chernobyl accident and Fukushima catastrophe on human health. One part shows an analysis of German perinatal mortality rates in association with strontium in the fallout from nuclear weapon tests in the 1950s and early 1960s suggesting about 100,000 excess perinatal deaths during 1955-1985. The second part discovers findings of a significant 5 % increase in perinatal mortality found in trend analysis in Germany in 1987, one year after the Chernobyl accident on 26 April 1986, and other impacts in contaminated regions of Ukraine and Belarus. The consequences of the disaster in Fukushima is topic of the third part. A trend analysis finds a significant 8.4% increase of perinatal mortality rates in 2012-15 in the seven most contaminated prefectures near the Fukushima NPP. The citizens' initiatives in the region have joined together using the label "Weltatomerbe Braunschweiger Land". Translated into English it is called "World Nuclear Heritage Brunswick Land". Please add here the workshops you would like to offer at the Network Gathering. Part 1: In small groups, we will work on short documents, newspaper articles, tables, cartoons etc. From such material, we can draw conclusions and lessons on the behind-the-scene influence of the EURATOM Treaty, on sometimes "hair-raising" plans and activities of EU and national bodies on the basis of EURATOM articles and regulations, as well as on attempts at reform of the Treaty. For a short overview about the international treaty please have a look at this flyer: "Protecting your environment: The power is in your hands - Quick guide to the Aarhus Convention"
On 28th of June first Castor shipment on Neckar river from Obrigheim NPP to Neckarwestheim NPP took place - activists organized vigils, rallies and protest actions, for instance an abseil action from a bridge across Neckar river stopped the transport for a while. It was the first time that filled Castor casks were transported by ship. In total 342 high level radioactive spent fuel elements are supposed to be moved to an interim site at Neckarwestheim NPP. They will be assembled to 15 Castor casks, and in one transport three of them will be shipped. 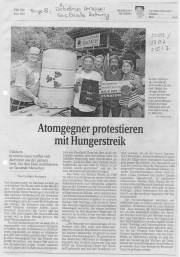 The 2nd transport could start during the International Anti-nuclear Summer Camp in Döbeln - organizers with the alliance "Bündnis Neckar castorfrei" expect it to take place at the latest during the week of 24th of July (after the camp), but it might actually happen earlier. Within the Nuclear Heritage Network a translation project gathers committed people willing to support anti-nuclear struggles by translating text from one language into another or by proofreading such. With this workshop we would like to spread the word and ask participants of the camp whether they want to commit to translations support, too. 2018 Network Gathering - where will the next gathering take place, who will arrange it? Since autumn 2013 we have as a new structure the "International Network Office" in Döbeln, Germany - so far it is offering opening hours every Wednesday from 2-4 PM CET to support anti-nuclear groups looking for experts and speakers for their events and to help them to connect to other anti-nuclear groups working in similar fields. Partly we had three volunteers in the Network Office; at the moment we are looking for new volunteers for the next months. With the ATOMIC BALTIC network/project we developed a new regional anti-nuclear network for the Baltic Sea region which is connecting and supporting groups and activists in the area. The NukeNews newsletter system has been started in 2011 and will until summer probably include one more Eastern European language. Upcoming events have been continuously collected and published on the Nuclear Heritage Network website - several hundred local and global events can be found there now. However, still a focus on certain regions from where the information flow works better, is visible. We would like to improve that and receive the events from other countries, too. Besides that the plans to produce and spread multilingual information materials need active support, which should also be brought forwards in the gathering. If you want to participate in the 2017 Nuclear Heritage Network gathering, but your financial situation would make it difficult, please get in touch with us. We will try to support you regarding travel costs expenses, if you contact us in advance. The earlier you send your request, the better the chances to find a cheap possibility of transport for you that we could support. However, we can't guarantee support for travel costs as this gathering will be based on a low-budget basis without a particular funding. Thus, our ability to support disadvantaged participants will depend on donations and solidarity contributions to the participation fee. We invite all interested people, activists, organizers and committed experts to join this 2017 Nuclear Heritage Network gathering, who are willing to improve the support structures for anti-nuclear projects, learn about nuclear topics, and discuss strategies to strengthen struggles against the atomic business. If you are interested, please announce your participation by June 30th, 2017. Spontaneous participation will be possible, too, but it is very valuable for us to have an idea of the participants to prepare the event. However, late announcements of participation will make it less likely that we will find a way to help participants who need travel costs support. For the participation we will ask for a fee based on your own consideration for our expenses (camp infrastructure, preparation, promotion, travel costs support) - Find here the bank details for your contribution. In case you want to make an extra donation to make this gathering possible we can issue you a confirmation of your charitable donation for your tax declaration, if you send us your postal address with the transfer or in an extra e-mail. We will have camp costs of average 13,22 EUR per day and person, we suggest you to give a participation fee of something between 9-15 EUR per day depending on your financial opportunities. Those who can pay more should do that so participants who can't afford it will be able to pay less. In case someone can't pay the suggested participation fee, please get in touch with us - we will do our best to make it possible for everyone to join the international anti-nuclear gathering. However, the solidarity of those who can afford it is essential to make participation of everyone possible! Please transfer your participation fee in advance to the following bank account mentioning the name(s) of participants and days paid for. For joining the preparation days until 16th of July and for putting down the camp / cleanup from 24th of July, no participation fee is expected! If you can't make the bank transfer in advance, please let us know and bring the amount you would like to pay in cash to the camp. However, we have expenses to cover already before camp start, thus it is helpful to do the bank transfer. You can send an e-mail to summercamp AT nuclear-heritage DOT net, call us in the International Network Office at +49 3431 5894177 during the opening hours (Wednesdays from 2-4 PM CET) or write a letter to Nuclear Heritage Network, Am Bärental 6, D-04720 Döbeln, Germany. We have now a camp mobile phone - to reach us, particularly between July 17th and 23rd, please call this number: +49 1578 9165215. Though the participation is individual, we will ask participants whether they are representing an organization that officially can be mentioned here to shape a picture of involved groups, associations and NGOs. This page was last modified on 12 June 2018, at 23:56. This page has been accessed 44,481 times.